I have to admit I was shocked to see a new AoU Hulk figure – even if it is from the cheaper line sporting less articulation, duller sculpting and more. But hey, there is another figure! It it looks like a Grey Hulk! Even though the Hulk didn’t display the grey hue in the movie I always like seeing a new Grey Hulk released! I found this at TRU this past week but had no prior knowledge that this figure was even being made! Obviously inspired by the Scarlet Witch scene where the Hulk is brain washed and goes on a rampage. The screaming, red eyed, angry Hulk is very cool – although I wish we had a variant for the ML AoU instead of the 3 3/4 figures – but since we don’t have a choice. As with every figure in this line the articulation is just in the neck, the arms and legs. The flat paint application doesn’t impress mush – but there are details that we didn’t see in the earlier figures – such as the redness around the eyes. Overall, this figure isn’t going to win any awards but since the pegs have been pretty barren with new Hulk figures for a while this was a nice surprise! I am currently working on a MiniMates exclusive post that highlights all the Hulk releases that MiniMates has put out. There are quite a few too… way more than I ever thought there would be! Everything from Classic Hulk and Mr. Fixit to Maestro and Nul. Fan favorites such as World War Hulk to Merged Hulk have all been made – but some of my favorites are, much like this one, a classic Hulk. Walgreen’s has been having a few Marvel exclusives pop up – the ML Agent Venom was pretty awesome – but this, as far as I know, if the first Hulk related one. Under the Avengers Assemble banner we have a Hulk and Captain America set. A List I Can Get Behind! Click on the image to be brought to a web-site that features a fun list of the Hulk’s “Crowning Moments of Awesome”. I agree with a lot of them and enjoyed looking through the rest of the site. 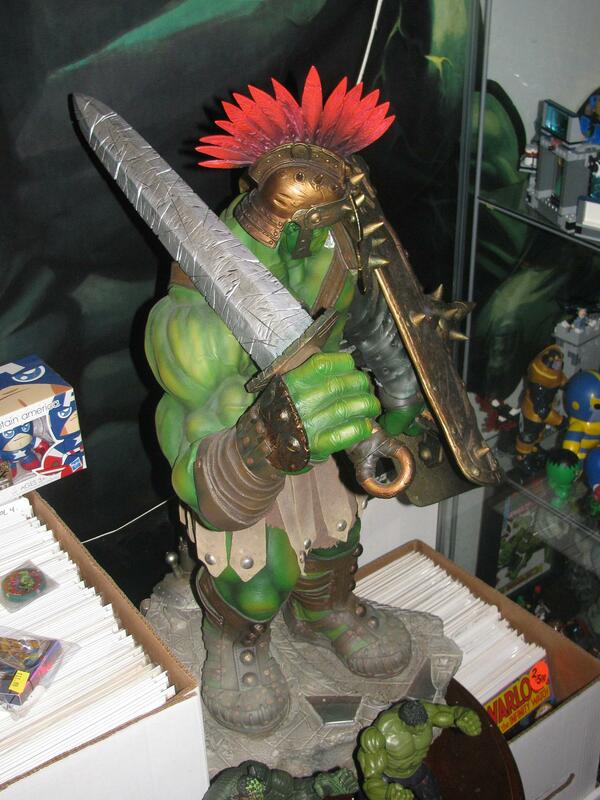 Sideshow has produced quite a few Hulk busts, maquettes and mixed media statues called Premium Formats. 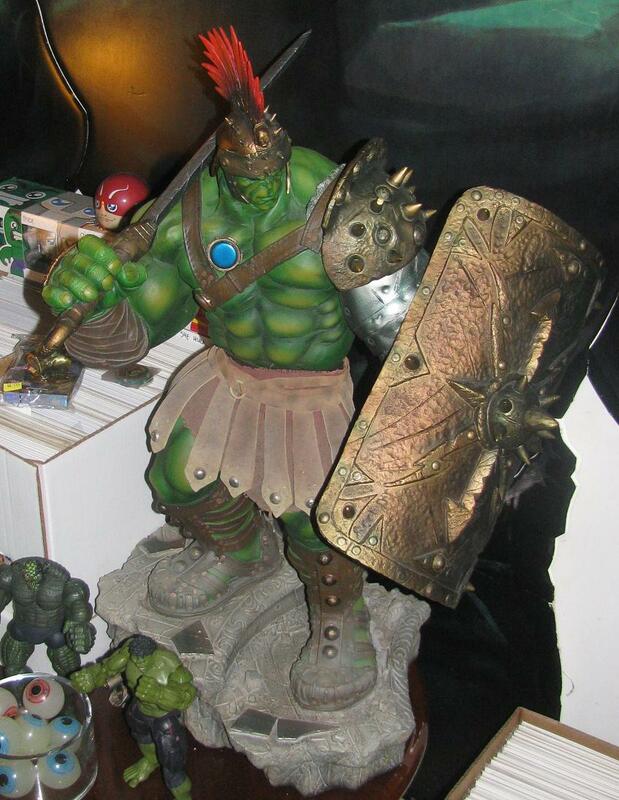 The original release is easily one of the best Hulk statues ever produced – a statue that has slipped in and out of my collection over the years. The latest PF I have was sold to me by a friend who had a little bad luck when hurricane Katrina blew through NJ resulting in a boxless piece. I know some collectors focus on the 4-color outerbox as making it a complete statue but seeing as people don’t display the box I was happy to be able to replace that Hulk into my collection – thanks again, Mike! I haven’t bothered picking up too many other Hulk statues from Sideshow as I thought they were overpriced and the likeness were completely off (I’m talking to you buzz-cut Hulk Maquette!). 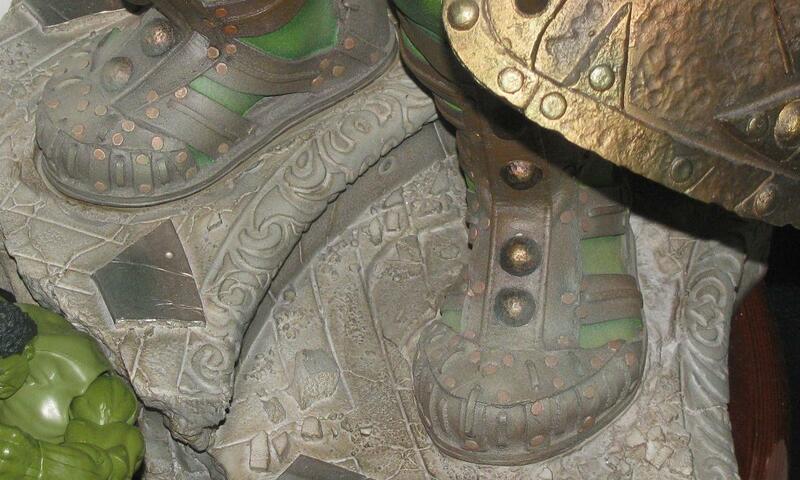 Then SS announced the Galdiator Hulk – or as I like to call it – the SS Planet Hulk! Unlike earlier SS Hulks this one looked fantastic from the get-go. I still cringed when I saw the asking price of $600 and resigned myself to not getting another SS Hulk piece – but then something extraordinary happened. See, I’m the kind of consumer who is not inclined to just buy a piece based off pictures – I need to see it in person – and as would luck would have it my LCS ordered it. They displayed in the case and the manager continued to to point out what a great statue it was. I agreed – but still thought the price was too much. Then it happened. Someone bought it. Yes, you read that right, someone bought the statue and it disappeared from the store and I forgot all about it. Of course, three months later, the Hulk reappeared into the case. The manager pointed it out as I walked into my LCS that Wednesday and told me to take a lok at the price. I’m not going to say just how much the price was reduced – but let’s just say, due to the former owner’s girlfriend being upset over the purchase said boyfriend had made without consulting her first. I have said it over and over – Size does not make a statue great – but in this instance the size brings a presence to the piece that commands attention. It has adds an awe to the overall statue that doesn’t compare to anything else! 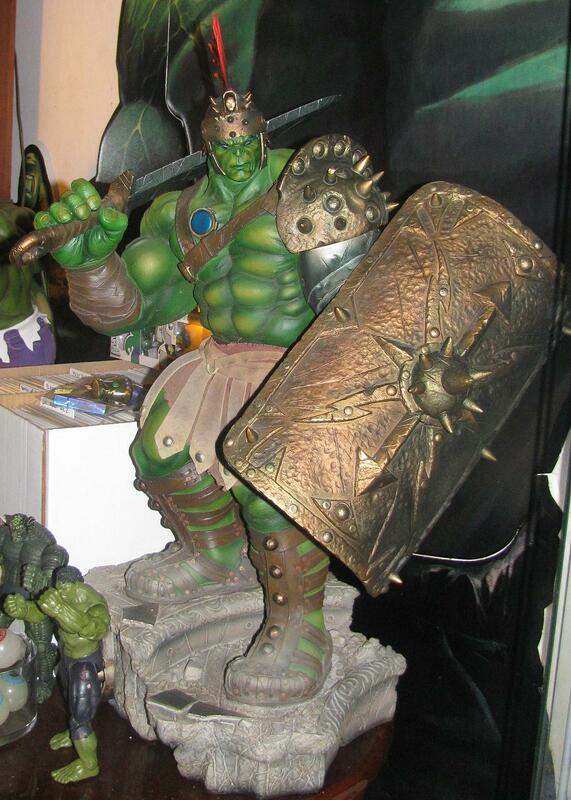 The weapons, the cavalier pose, the comic accurate gladiator armor and even the smug look on his face – it is easily one of the best Hulk statues to come out in a long time! They have released a World War Hulk version that I hear people are ecstatic about but I can’t see buying (or getting as good of a deal that makes another purchase worth it) that piece. I think this is the one to get though – one that I am happier to have as, story wise, Planet Hulk will live on as one of the greatest stories ever told. World War Hulk… ehhh – it will live on in infamy as the story told right after one of the greatest Hulk stories ever told. I am pretty sure having a new Hulk Pez released every year would become a holiday – much like Presidents Day… or at least Columbus Day! Kids should get the day off of school and people all over the country would make pseudo intellectual Facebook posts about it. I guess I should just be happy to see a new Hulk Pez in the stores these days seeing as a we had the same Hulk Pez for close to a decade adorning the pegs in the stores. This Hulk resembles the Gary Frank Hulk with a Salon style boy’s haircut. Washed and blown of course. While we’re on the subject though… does anyone think that Pez all tastes the same? I know it says Raspberry, Orange and Strawberry – but all I taste is red tart sugar, orange tart sugar and pink tart sugar.